Fashion Polish: Finger Paints Fun-Fetti and... Happy New Year!!! Finger Paints Fun-Fetti and... Happy New Year!!! I hope you gilrs have had a wonderful time this weekend! Mine was really quiet, I wasn't feeling so well and I'm still really exhausted as we speak. Not exactly what I had in mind for these 3 days off... Oh well, I did have a beautiful mani all along LOL. Well, that's it for today, I wish you all the best year ever! May all your dreams come true. Mine : try and answer more comments! I truly appreciate each and every one of them but seriously lack time to reply. Love it layered over black. Oh my god, I seriously need one Fun-fetti for me...'cause I don't buy OPI anymore! Super cute! I like the finger in the close up with a bunch of blue in the middle! My friend and I saw a rainbow glitter like this that had a lot more blue than Rainbow Connection and Fun-fetti, but derp derps that we were, we passed it up that day and regret it! It's dazzling & luxurious!!! I love this kind of glitter! Glittery ;0). Love it!! Get better soon! I love it! 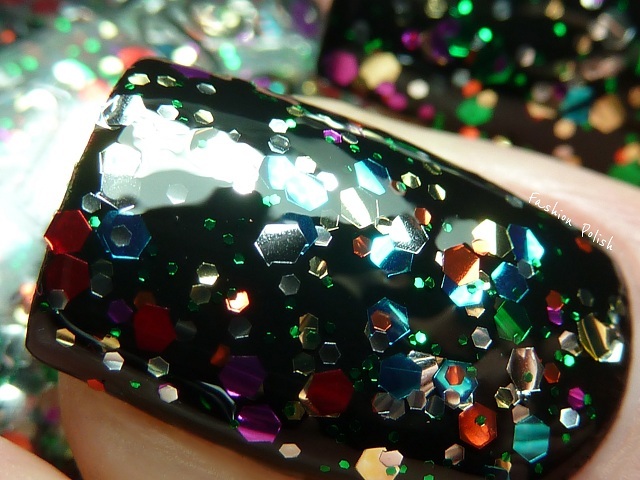 Even though it wasn't yours, it would still make a fun NYE Manicure! Happy 2012! So much fun! I recently discovered FingerPaints and they are a lovely brand. Beautiful! 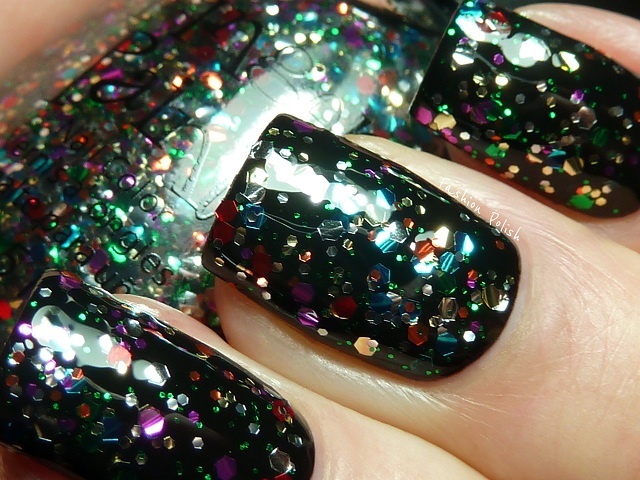 I love this glitter, it's amazing and looks fabulous on you. :) Happy New Year! I don't have this polish but have Happy Birthday by Deb. Lippmann which was the inspiration for a lot of these multi shade glitters. It's fun and perfect for new years! Such gorgeous glitters! Happy new year! This is really pretty! Love your macro shots. I love Wish Upon A Rock-Star so I definitely love Fun-Fetti! Happy New Year! This finger paints color looks a lot like OPI rainbow connection!